Beautiful bouquets of flowers on display at the Cours Saleya Market in Old Town Nice in Provence, France in Europe. The Cours Saleya Market in Old Town Nice in Provence, France has a variety of gorgeous and extremely fragrant flowers for sale on a daily basis. The colors of these flowers are all put together in a creative manner and very delicately put into a beautiful bouquet. 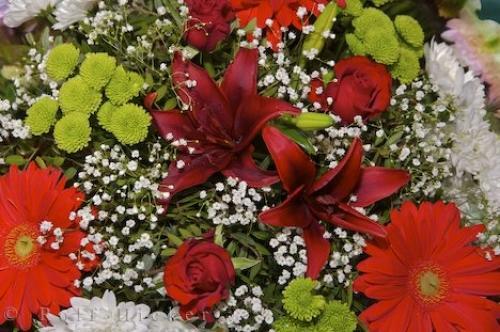 There are a different assortment of flowers at the market which are suitable for any occasion where flowers are needed. The Cours Saleya Market is open daily and the best time to get the freshest quality of flowers is around six a.m. when all the vendors are still setting up and everything has just been cut. You will need plenty of change and small bills as vendors do not like to handle large bills when buying the smaller items. Photo of an incredible bouquet of flowers sold at the market in Cours Saleya in France, Europe. Pictures from photo gallery "Flower Pictures"
This picture is part of the photo album "Flower Pictures" - there are more beautiful images waiting for you. I photographed this photo with the digital SLR camera model Canon EOS-1Ds Mark II, aperture of f/6.3, exposure time of 1/40 sec. on ISO 100, as always I used a original Canon Lens, the focus lenght for this picture was 58mm.